PRINCE KAYBEE: A GIRL CAME IN BETWEEN US! 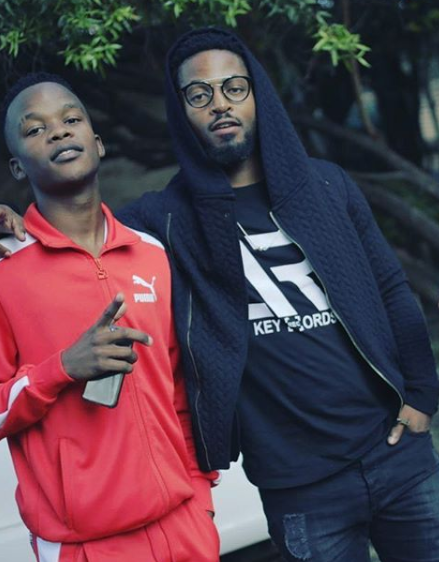 Renowned House music producer and DJ, Prince Kaybee has addressed the beef between himself and his prodigy, Troy Nkazimulo Sthembiso Ngema, aka TNS. TNS has accused Kaybee of sidelining him, stealing his work and not giving him credit where it is rightfully due to him. But, Kaybee claims that the beef started long before what we now know and is in fact, over a nyatsi. According to Kaybee, the drama began last year when TNS slept with his then girlfriend, twice. The Wajellwa hit-maker was on MetroFM’s The Drive last week to speak about his latest single with Msaki, Fetch Your Life, and also to address the on-going allegations. “It’s a bit personal because TNS used to live with me last year. We both co-produced Club Controller and Banomoya. I saw the allegations this morning [and] funny how these things come out when I just dropped Fetch Your Life,” Kaybee told Mo Flava and Masechaba Ndlovu. The famed hit-maker says that he cannot believe that this is happening because he was there for TNS when nobody else was. “TNS came to me last year saying he doesn’t have parents. I opened up everything for him, finances, my home, everything,” he said. “It’s disappointing because a girl came in between us. To look at me in my eyes and do the things that you’re doing,” he continued. Kaybee told the drive team that TNS’ then girlfriend sent screenshot to him in which she confronted TNS about sleeping with Kaybee’s then girlfriend. READ AGAIN: PRINCE KAYBEE DRAGS "CAUCASIAN HOUSE DJs"
The producer, whose real name is Kabelo Motsamai, said that TNS was found sleeping with his girlfriend at her place. “It was true in the sense that it was the second time she finds TNS doing this thing. Apparently the first time she walked in and said: “yho you need to confess to Kaybee and tell [him],” he went on. Kaybee also said that he is hurt because of all the things he has had to sacrifice for TNS. “I’m still trying to handle it, this is actually the first time I’m speaking about it. I feel like I’m in a corner now because there’s allegations of me not paying him, allegations of me taking a song from him, so many allegations,” he said. The allegations he refers to are the ones made by TNS, claiming that he is the sole producer and owner of both Club Controller and Banomoya and should therefore be credited as such. Kaybee disputes these rumours and claims that they worked on the projects together. “None of them are true; the song of the year, Banomoya is co-produced. It’s always a 50/50 split. Even with Msaki with Fetch Your Life, she came in with the vocals, I came in with the music, so it’s only fair to split it 50/50,” he said. Meanwhile, TNS recently told Durm magazine that he has no beef with Kaybee, he just wants what is due to him. “Prince Kaybee and I are cool. He is a big brother and role model but I feel sidelined and in his shadow when I'm the one who made the songs,” he told the publication. TNS also told the publication that he produced Club Controller in 2017 and that it eventually “got leaked and was being played by DJs across the country and he got shocked when Prince Kaybee allegedly called him to try and buy the song”. “I gave him [Kaybee] a chance because other established DJs offered me peanuts for the track. People say the song belongs to Prince Kaybee and Busiswa but it’s mine. I made that song. I spoke to Prince Kaybee about the matter and he told me to humble myself, I’m a nobody,” TNS told Drum. In the same piece, Kaybee again denies the allegations of theft, claiming that he is the rightful owner of the songs. “He and I had an agreement and he knows that the song now belongs to me. How do I beef with an 18-year-old? TNS‘ name is on the song and he will get the royalties due to him,” Kaybee told Drum.